A savoury coating mix, a creamy white wine sauce and 10 minutes of prep, elevates pork tenderloin to company status. You'll love that this roasted pork is on the table 30 minutes later! 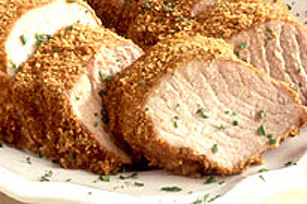 MOISTEN pork tenderloins with water and coat with coating mix as directed on package. Bake at 400°F (200°C) for 30 minutes. MEANWHILE combine whipping cream, wine and mustard in a small pot. Bring to a boil, reduce heat and simmer uncovered until sauce is thick enough to coat a spoon. TO serve, slice tenderloin into 1/2-inch (1 cm) slices. Pour 3/4 of the sauce onto a serving platter and place slices of pork on top. Drizzle with remaining sauce. Garnish with chopped parsley.